Micropterigidae is a small family of very primitive moths. Larvae may be "scavengers" (possibly associated with liverworts), or they may feed on living plant tissue. The adult displays a number of primitive character states. For example, it is notable among Lepidoptera in that it retains functional mandibles (although they are extremely small and difficult to see in pinned specimens); apparently, it uses the mandibles to feed on pollen. Also, the wing venation is "homoneurous" (i.e., the venation is complete in the hindwing, just as in the forewing), whereas in almost all other Lepidoptera, the venation is "heteroneurous" (i.e., the venation of the hindwing is markedly reduced, compared to that of the forewing). Finally, the front and hind wings of Micropterigidae are coupled by a jugum (Fig. 1), rather than by a frenulum (Fig. 2) as in most other Lepidoptera. In fact, among all Lepidoptera with wingspan under 15mm that occur in Illinois, only Eriocraniidae shares the homoneurous, jugate condition with Micropterigidae. Figure 1. Micropterigidae: Epimartyria auricrinella. Adult, dorsal aspect, showing the jugum, a small flap of forewing membrane that overlaps the hindwing near the base, to serve as a coupling mechanism for the two wings. Inset, close-up view of jugum. Figure 2. 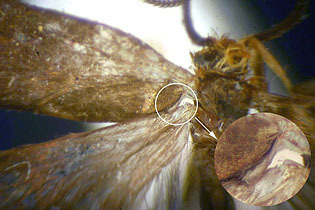 A typical frenulate moth (Tineidae); ventral aspect, showing the frenulum, a bristlelike structure that originates near the base of the anterior margin of the hindwing and runs along the ventral surface of the forewing, where it is received by a scale-covered flap called the retinaculum. Other than in very primitive groups such as Micropterigidae, the frenulum/retinaculum is the predominant system of wing coupling in moths. Two species of Micropterigidae are native to North America; only one of these, Epimartyria auricrinella (Fig. 3) occurs in the eastern USA. It has not been recorded from Illinois but has been collected in Indiana, only a few miles from the eastern border of Illinois. It probably occurs in the northern and eastern parts of Illinois, especially in unglaciated sites that harbor liverwort beds in heavily shaded mesic areas at the bases of sandstone cliffs. On the biology of E. auricrinella in southern Canada, Dr. Jean-François Landry writes that the "larvae feed on the leafy, moss-like kind of liverwort; I find them on Bazzania trilobata. I don't know if they feed or occur on thallose liverworts; I never found them there. I think that, at least up here, the larva takes two years to develop. I find two very different size classes in autumn, tiny ones and big ones; but only one adult cohort in early summer." In Illinois, the adult of E. auricrinella probably should be sought in early July. It is not attracted to artificial light at night; rather, it is most likely to be found during the day, either by disturbing the area in and around a liverwort bed so that the moth will fly upward and be detected, or else by randomly sweep-netting just above the liverwort bed. It should be noted that, in some Illinois sites of the type mentioned above, adults of a tineid moth, Doleromorpha porphyria, which is similar in general size and appearance to E. auricrinella (and thus might be mistaken for it), are found commonly on liverworts during the summer months. Specimens of D. porphyria can be differentiated from E. auricrinella by their heteroneurous wing venation and frenulate wing coupling (see above), as well as by their having a prominent, coiled haustellum, as is characteristic of most Lepidoptera (the haustellum is not evident in E. auricrinella). Figure 3. Epimartyria auricrinella. Left, spread adult; right, live adult (photo of live moth generously provided by Dr. Jean-François Landry).